We're just two weeks away from the first night of Rosh Hashanah. As we head into the High Holidays, look for Jewish Humor Central to be more holiday-centric. 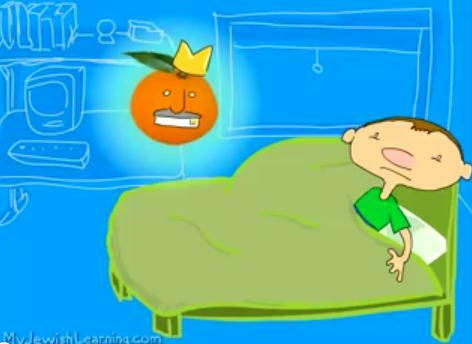 Today we present The Adventures of Todd and God, a little cartoon gem about the custom of eating a new fruit on the second night of Rosh Hashanah to fulfill the Shehecheyanu blessing. Usually it's a fig, a pomegranate, or some weird fruit that seems to have been cultivated only for this purpose. But an orange? An orange???? This episode of The Adventures of Todd and God comes from myjewishlearning.com. It was produced by William Levin, also known as The Jewish Robot. Levin is the creator of the comic strip and animated series, Shabot 6000. He produces cartoons and videos that have been featured on The New York Times website, ABC Good Morning America,G4techTV, and in film festivals, and has been written up in publications including The Forward, The Jewish Week, and The Jerusalem Post. He was inducted into the Writers Guild of America - East in 2009, and is a writer for Shalom Sesame, a Sesame Workshop coproduction of Sesame Street.